Nutritional therapies have been key early interventions, and remain central to the well-being and survival of patients with cystic fibrosis. The nature of the disease causes significant alterations in a patient's ability to process and assimilate nutrients. Furthermore, many factors contribute to higher metabolic demands throughout a patient's life. In combination, maldigestion, malabsorption, and increased metabolic demands pose a high hurdle for the patient to overcome in order to maintain optimal nutritional status. Nutrition in Cystic Fibrosis: A Guide for Clinicians is an excellent resource for physicians, nurses and dietitians who deliver care for patients with cystic fibrosis. 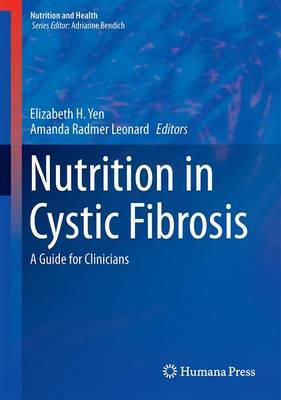 The book provides an introduction to cystic fibrosis and nutritional assessments. It will also serve as a comprehensive guide to the nutritional monitoring and management of patients with cystic fibrosis including special populations within cystic fibrosis that require additional considerations. The chapters are written by experts in their fields and include the most up to date scientific and clinical information. Nutrition in Cystic Fibrosis: A Guide for Clinicians targets pediatric and adult pulmonologists and gastroenterologists, residents and fellows, internists, pediatricians, nurses, dietitians and general practitioners who treat patients with cystic fibrosis.